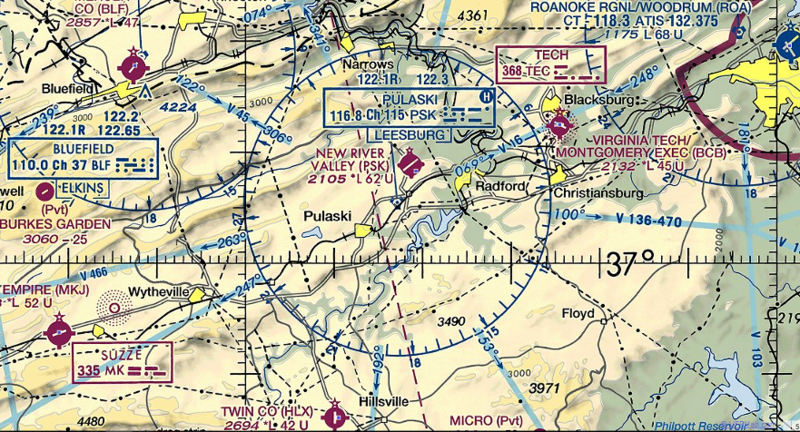 Three Virginia airports no longer offer scheduled passenger service: New River Valley Airport (PSK), Hot Springs/Ingalls Field (HSP), and Danville Regional Airport (DAN). 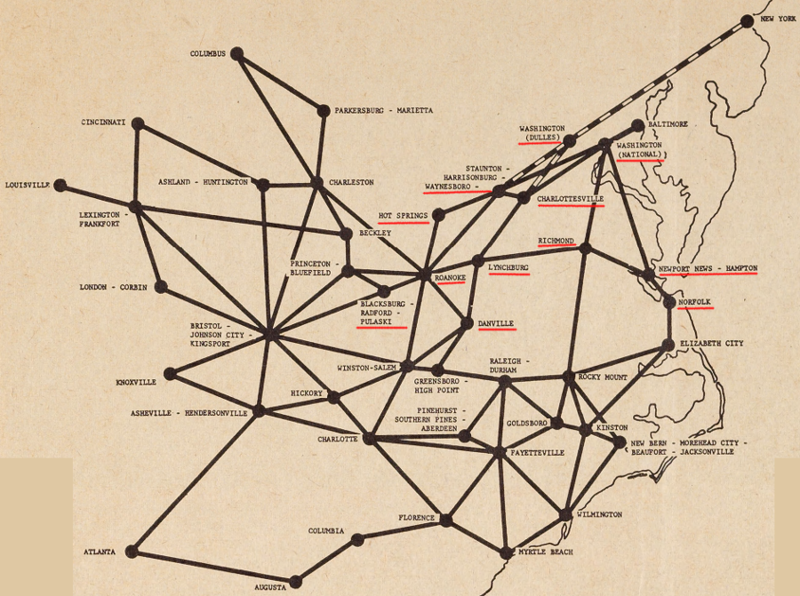 In addition, Piedmont Airlines sought approval from the Civil Aeronautics Board in 1962 to offer scheduled passenger service to Shannon Airport (KEZF) at Fredericksburg, but that proposal was rejected. Hot Springs was the last Virginia airport to get scheduled passenger service, in 1964. 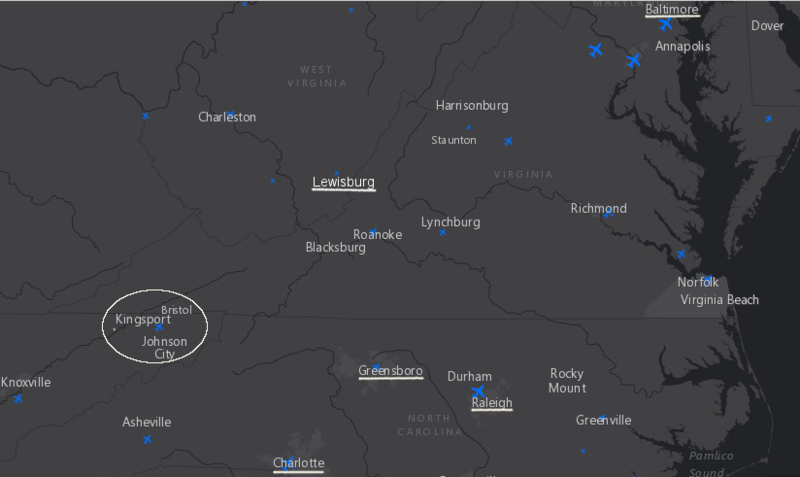 Only two of Virginia's airports now offering scheduled passenger service - Shenandoah Valley Regional Airport (SHD) and Roanoke-Blacksburg Regional Airport (ROA) - are west of the Blue Ridge. Five of the nine airports - Dulles International Airport (IAD), Reagan National Airport (DCA), Richmond International Airport (RIC), Newport News/Williamsburg International Airport (PHF), and Norfolk International Airport (ORF) - are in Virginia's crescent-shaped population center, stretching from Northern Virginia through Richmond to Hampton Roads. The first airport in the United States was a prairie field developed in 1904 near the workshop of Orville and Wilbur Wright in Dayyton, Ohio. In Virginia, the first flying field was at Fort Myer, a site used by Orville Wright to demonstrate aircraft to military officers in hopes of making a sale. The first municipal airport was proposed in 1919 at Atlantic City, New Jersey. The Army Air Service lacked the funding after World War I to build military airports. It encouraged development of municipal airports, which started after the US Congress passed the Air Mail Act of 1925 and the Air Commerce Act of 1926. The Federal government supported aviation through contracts to carry the mail, but required local/state governments to build the airports. Starting in the 1950's, Piedmont Airlines developed into the dominant local carrier in Virginia. At one time or another, it flew into every Virginia airport with scheduled commercial flights. The last addition to its schedule in Virginia was in 1966, when the Civil Aeronautics Board granted Piedmont Airlines authority to fly from Dulles International Airport (IAD). Piedmont's Law: The shortest distance between two points is not through a big, busy connecting airport. Airports that offer scheduled commercial passenger service are clearly beneficial to economic development in a community. Such facilities draw customers from an area, a "hinterland," in the same way that port cities such as Alexandria established economic connections in the 1800's with rural areas that needed access to a seaport. Virginia airports draw customers from other states, and Virginia residents can choose to drive to airports in other states. 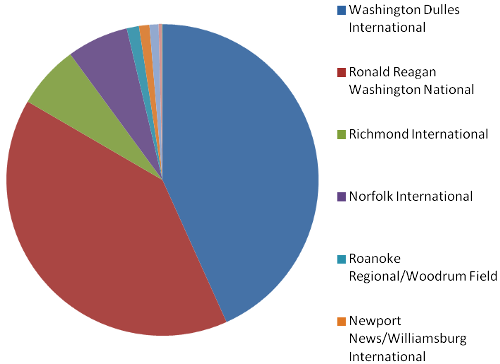 All nine of Virginia's airports offering scheduled passenger service are not-for-profit, publicly-owned facilities, but they operate like businesses and compete with each other. The hinterland includes the primary catchment area from which most passengers come. Competition is more intense in the secondary catchment area, further from the airport terminal and closer to other airports. The catchment area for more-expensive flights is concentrated closer to the airport. If the inconvenience of driving the extra distance is offset by the savings in time or money, an airport can extend its catchment area. 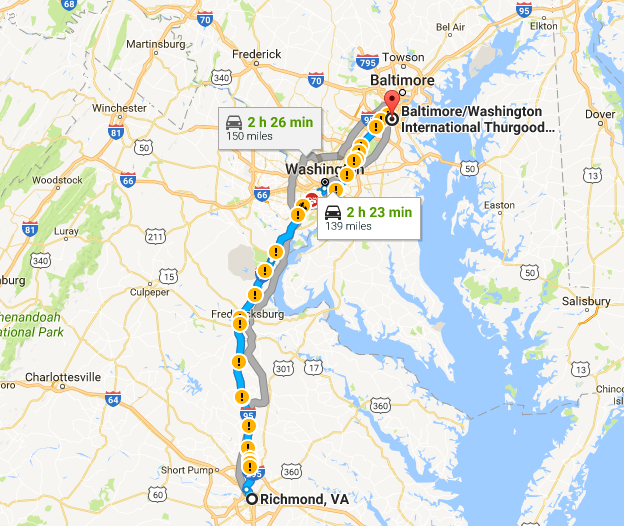 For example, Northern Virginia residents who live close to Dulles (IAD) or Reagan National (DCA), but can save significant amounts of time/money by catching a Southwest flight from Baltimore-Washington International (BWI), may choose to drive the extra distance. Maryland residents may drive past BWI to catch an international flight from Dulles (IAD) that is more-direct and does not require a layover in an intermediate airport. The number of passengers boarding an airplane (enplanements) or getting off (deplanements) at an airport reflects the population of the area, competition from nearby airports, and of course the desire of residents in that region to fly somewhere else. A large population base generates more traffic, so airports in urban areas attract more carriers. Competition results in flights scheduled more frequently and to more locations, and also lower costs. With the hub-and-spoke scheduling pattern of airlines, fights from smaller airports feed passengers into larger airports that offer non-stop flights to more destinations. Richmond and Charlottesville residents can not catch a direct flight to the West Coast, or to Europe, from Charlottesville Albemarle Airport (CHO) or Richmond International Airport (RIC). Within Virginia, two Large Hub airports, Washington Dulles and Reagan National, both offer connecting itineraries. However, most connecting itineraries to or from Virginia�s Small Hub and Non-Hub airports do not pass through Washington Dulles or Reagan National. For domestic connecting journeys from Virginia's Small Hub and Non-Hub airports, just 7.3 percent of passengers connected through Washington Dulles or Reagan National in 2005. By 2014, this number had increased slightly to 7.6 percent. Instead, Atlanta and Charlotte are the two most popular connecting hubs for domestic passengers; together, these hubs control over 56 percent of the domestic connecting traffic from Virginia�s seven Small Hub and Non-Hub airports. Areas with smaller populations generate fewer customers, and thus lower profits. An airline typically will charge higher fares at smaller airports, so the limited number of passengers will cover the fixed costs to provide service and will generate a rate of return on the airline's investment comparable to flying to airports with many customers. In response to high fares and a limited selection of destinations at small airports, travelers will drive several hours to reach a different airport with greater competition and better service. Airports near the border of Virginia in Maryland, Tennessee, and North Carolina compete with the nine Virginia airports that offer scheduled commercial passenger service. Dulles International Airport (IAD) and Reagan National Airport (DCA) pull passengers from the Richmond and Charlottesville area as well as the Shenandoah Valley. The headaches of parking and passing through airport security is such a deterrent that some customers from Central Virginia drive directly to Northern Virginia airports, eliminating the "hop" from the smaller airport. 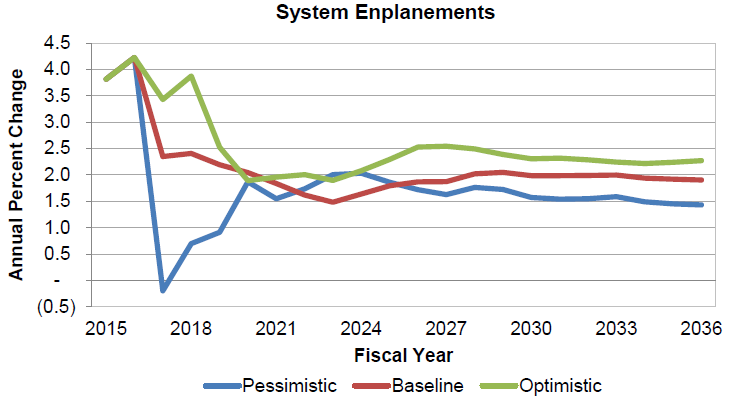 That may require more time in traffic on Route 29 or I-95, but can eliminate the potential of a missed connection as well as reduce overall time and costs for a long trip. Baltimore-Washington Airport (BWI) draws Northern Virginians across the Potomac River, in part due to the many low-cost flights scheduled by Southwest Airlines. 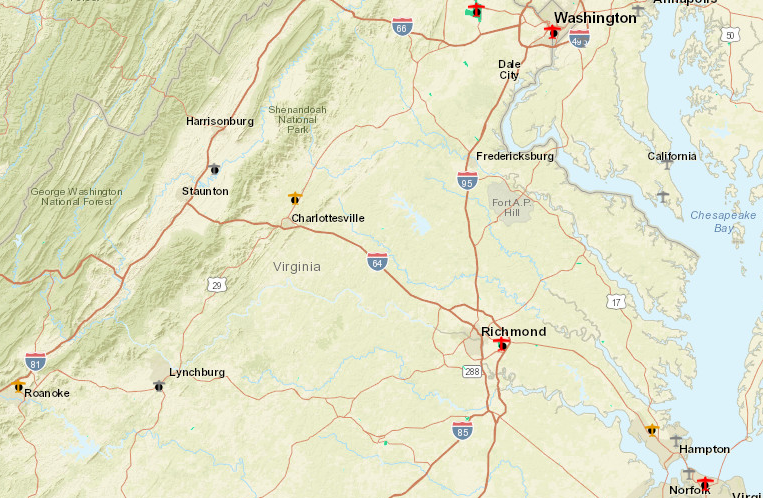 The airport provides driving directions for customers coming from as far south as Richmond, making clear that Baltimore-Washington Airport (BWI) views Central Virginia as part of its catchment area. For many living in Southside Virginia, North Carolina airports in Greensboro, Raleigh, and Charlotte offered the most-convenient and lowest-cost commercial airline service to a wide range of destinations. 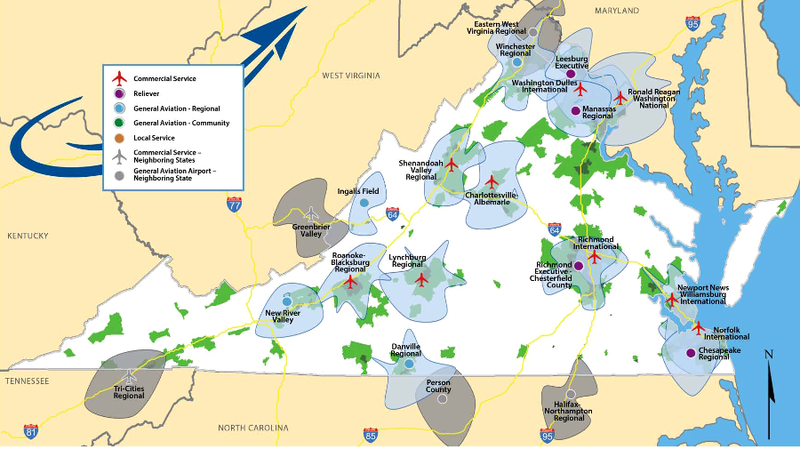 Potential airline passengers drive to out-of-state airports from the local "capture area" surrounding Virginia's nine airports with scheduled commercial service. 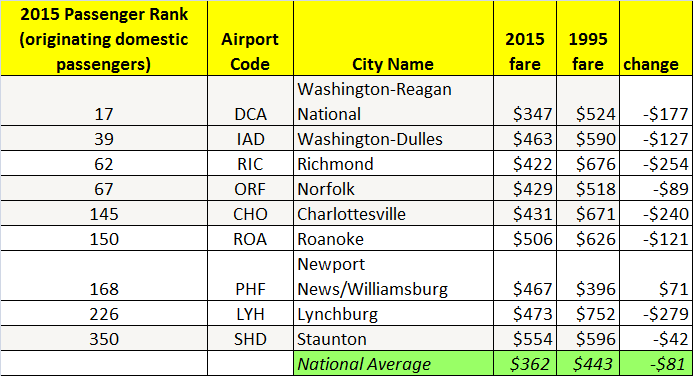 Until Virginia's airports can offer cheaper flights and better schedules, "leakage" will continue to airports in Baltimore (MD), Lewisburg (WV), Blountville (TN), Charlotte (NC), Greensboro (NC), and Raleigh (NC). 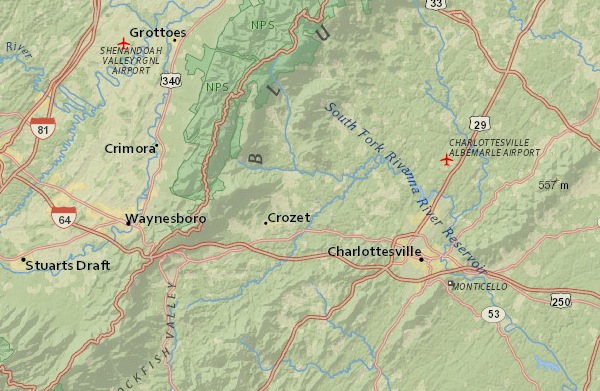 The best option for some Southwestern Virginia residents is the Tri-Cities Airport (TRI). 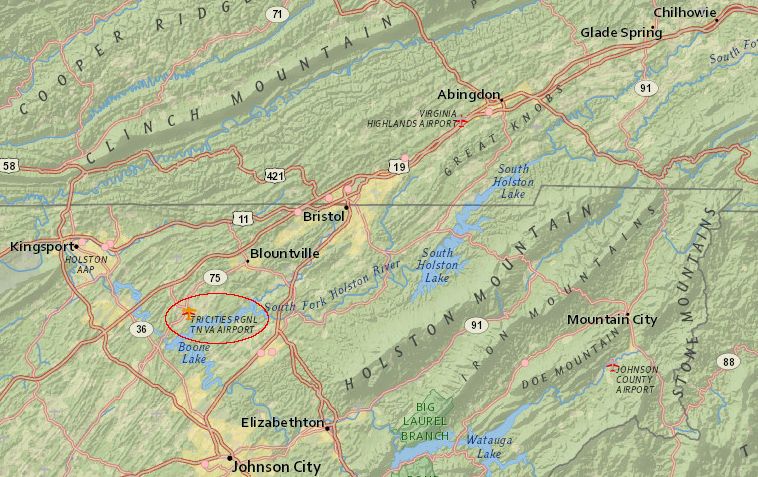 It is located in Blountville, Tennessee, near the "tri-cities" of Bristol, Kingsport, and Johnson City. In 2016, Allegiant, American, and Delta Connection offered scheduled service from the Tennessee airport to Atlanta, Charlotte, Orlando, and Tampa-St. Petersburg. Bristol, Virginia has one voting member on the 12-person board that manages the airport; the other members represent jurisdictions in Tennessee. 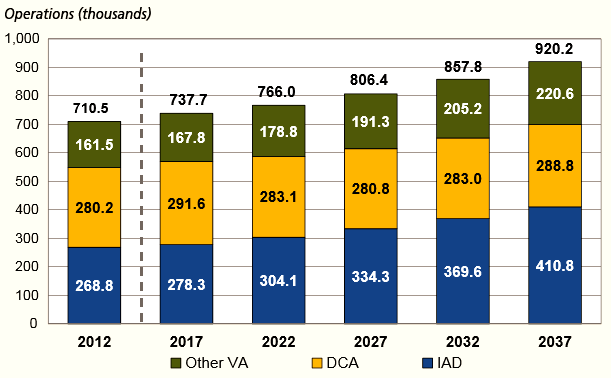 The number of travelers using Virginia airports declined between 2007-2013, as the airlines focused on servicing major hubs and reduced flights from smaller airports. Airlines exercised "capacity discipline" after the 2008 economic recession and limited expansion during the recovery, and squeezed more passengers into each flight. Scheduled domestic flights leaving from a Virginia airport dropped 12% during those years, and overall passenger traffic dropped by 5%. Newport News/Williamsburg International Airport lost almost half of its traffic in 2012, when low-cost airline Air-Tran cancelled service and chose to fly instead out of Richmond and Norfolk. The decline in air travel after the 2008 recession may have stabilized nationally, but in 2017 four of the airports in Virginia were still at risk of losing some existing service. 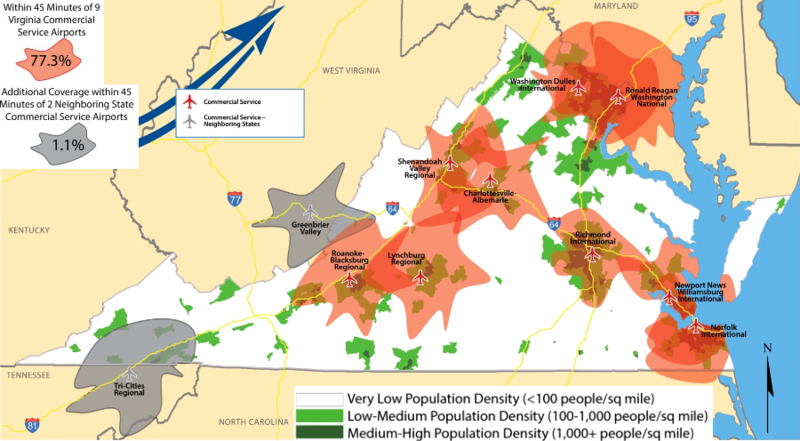 The Roanoke-Blacksburg Regional Airport (ROA) and Lynchburg Regional Airport (LYH) would be affected if airlines adopted different jets designed for longer flight distances. Newport News/Williamsburg International Airport has been threatened by reduced income ever since Air-Tran left in 2012. Shenandoah Valley Regional Airport (SHD) has been able to maintain limited scheduled passenger service only through the Essential Air Service subsidy, a Federal program which Congress could alter at any time. Reduced competition due to consolidation of airlines, creation of the hub-and-spoke system, and introduction of new jets has caused carriers to drop service to small markets. Three Virginia airports have lost scheduled passenger service - Pulaski in 1972, Hot Springs in 1993, and Danville in 1995. Was the First Successful Airplane Tested at Chopawamsic Island, Virginia?